We want to calculate the proportion of fake ballots in an election based on the results of limited audits. We have seen how the binomial and hypergeometric distributions give probabilities for the results of an audit given an assumption about the proportion of fake ballots. Bayes theorem can be used to calculate the inverse probability that we are after, once we have specified a prior. Since there are n + 1 possibilities for the number of fake ballots, we give each of them the same weight, which is 1 / (n + 1). We could express other knowledge with different choices of alpha and beta. But what’s the point of using the Beta, besides having a convenient way to specify priors? The point is that the Beta distribution is a conjugate prior of the binomial distribution. This means that the posterior distribution, once having taken into account available evidence, is also a Beta distribution. Meaning that the calculation of the posterior is much easier, as inference is just a matter of mapping the values of parameters of the Beta to some other values. 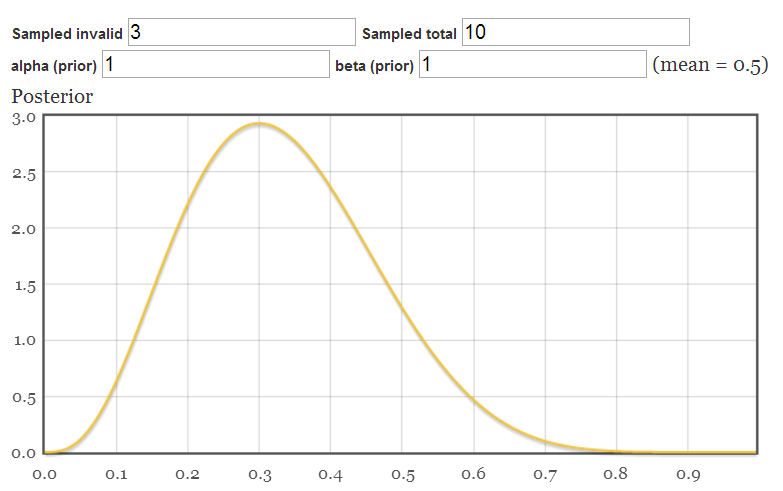 Here is the posterior of the Beta distribution when it is used as the prior of the binomial (this is called the beta-binomial model). with a beta prior, bayesian inference reduces to remapping the initial parameters alpha and beta, to alpha + k and beta + n – k, where k is the number of successes and n is the number of trials. Conjugate priors are an algebraic convenience that allow obtaining analytic expressions for posteriors easily. End of detour, please refer to  for further details. 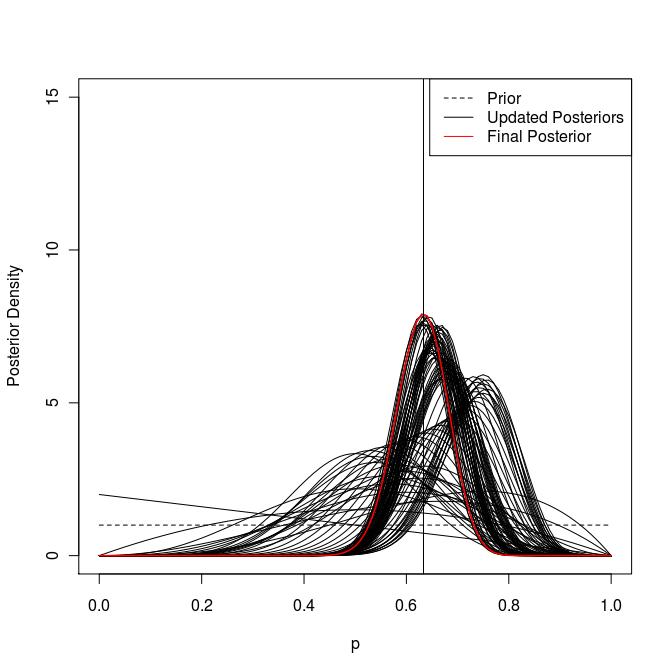 note how the peak of the distribution is at 0.3, it makes sense since in the sample 3 out 10 ballots where invalid. 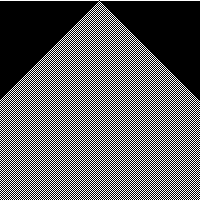 Evidence has transformed our initial uniform prior into the distribution seen above. This meets our original objective, a way to judge how many ballots are fake in the entire set of ballots based on limited audits. But it’s not the end of the story. What we would like also is to have an estimate as to whether or not the election result is correct. As we said previously, this estimation can be used either as a guarantee that all went well or in the opposite case to detect a problem and even invalidate the results. The probablity that an election result was correct, given uncertainty about fake ballots, depends on two things. One is the proportion of ballots that are fake, this is what we already have a calculation for. The other thing is the actual election outcome; specifically a measure of how close the result was. The reason is simple, if the election was close, a small number of invalid ballots could cast doubts on its correctness. Conversely, if the result was a landslide, the presence of fake votes has no bearing on its correctness. For our purposes we will stick with a simple example in which the election decides between two options via simple plurality. One final correction. Because we have sampled a number of votes with known results, we must apply our calculations to the remaining ballots. Let’s try an example, an election between option A and option B with the following numbers. In conclusion, the probability of error due to fake ballots in this election is less than or equal to 1.35%. 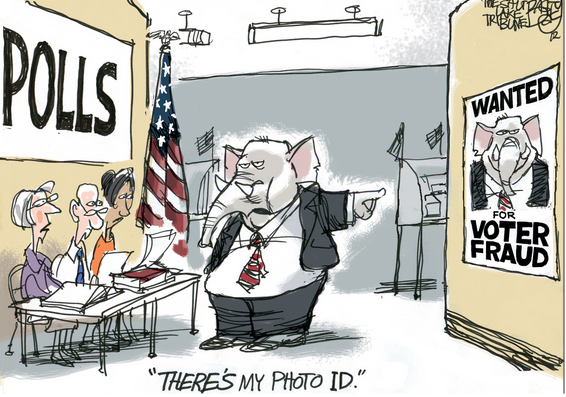 Personation is a term used in law for the specific kind of voter fraud where an individual votes in an election, whilst pretending to be a different elector. when someone practices personation multiple times to cast multiple votes we are talking about ballot stuffing. In this post we will consider an election in which authentication is not 100% secure, where personation is difficult but not impossible. Furthermore we will assume there is some available, but costly method by which ballots can be audited to determine whether or not they were cast via personation or were in fact valid. What makes the problem non trivial is that ballot auditing is costly and cannot in principle be performed for the entirety of the ballots cast. Hence we would like to estimate, from a limited number of audited ballots, how severe ballot stuffing was for an election. This estimation can be used either as a guarantee that all went well or in the opposite case to detect a problem and even invalidate the results. What we need is a mathematical model that given some information about the results of an auditing processes allows us to estimate the proportion of “fake” ballots in the set of all those cast. In other words, we are talking about statistical inference; in this post will use a bayesian approach. Let’s get to work. Imagine we have a box with all the ballots for an election, and the auditing process consists in randomly taking one out and determining whether it is valid or not, recording the result, and then repeating a limited number of times. After we have recorded the results of all the audits, we would like to know how many of ballots in the entire box are fake. Two things come to mind. First, that the result of each audit is binary, we either get FAKE or VALID. Second, that if the proportion of fake ballots in the box is p, then probability that a randomly chosen ballot is fake is p; the probability that it is valid is 1 – p.
In our example, k above corresponds to the count of fake ballots. So these distributions give us a way to calculate the probability that a specific number of fake ballots is obtained in the audit assuming a certain proportion of fake ballots in the entire election. For example, let’s say we have 100 ballots total and we know that 10 of them are fake. What is the probability that if we audited 10 ballots we would obtain a fake count of 3? Only 5%, it is unlikely we’d find 3 fake ballots with only 10 audits, given that there are only 10 out of 100 in total. 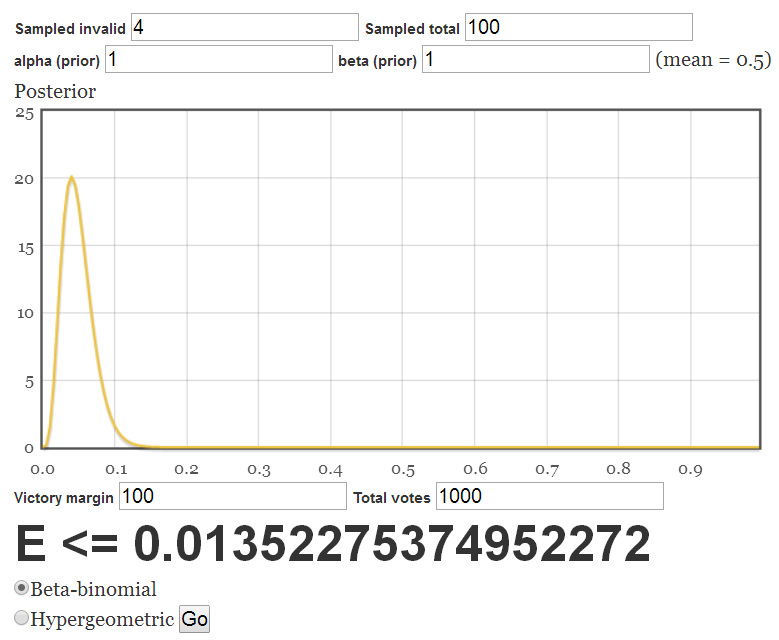 We have a way to calculate the probability of some outcome given some assumption about the proportion of fake ballots. But remember, what we want is exactly the opposite: given a certain result for an audit, we’d like to estimate the proportion of fake ballots in the entire set. It is this inversion that makes the problem a case of bayesian inference, and our friend Bayes theorem gives us the relationship between what we have and what we want. As seen in the bottom term. Because the bottom term is common to all values of Ai, it can be interpreted as a normalizing constant that ensures that probabilities sum to 1. The prior probability that some proportion of fake ballots occurs. This ingredient is crucial for Bayesian inference and the Bayesian approach in general. It is an estimate of the quantity we want to calculate that is prior to any of the evidence we obtain. It can be used to encode prior knowledge about what we are calculating. If we have no knowledge, we can try to encode that in a “neutral prior”. This last point is a very deep problem in Bayesian inference, as is the general problem of choosing priors. We won’t go into in detail here. Recap. We want to calculate the proportion of fake ballots in an election based on the results of limited audits. We have seen how the binomial and hypergeometric distributions give probabilities for the results of an audit given an assumption about the proportion of fake ballots. Bayes theorem can be used to calculate the inverse probability that we are after, once we have specified a prior. See it in action in the next post. There is an important difference, the binomial distribution models sampling with replacement, whereas the hypergeometric models sampling without replacement. In the next post we will consider this difference and its significance for our problem. Although the argument makes sense I am hesitant to accept 3) as is, and what it implies about how we think of causality. Two types of causal models have been developed over the last thirty years, causal bayesian networks and structural causal models. These two formalisms are largely equivalent; both make use of graph representations. Vertices in these graphs correspond to the variables under study whereas edges represent causal influences between the variables. Guided by these graphs, one follows precise procedures to obtain mathematical expressions for causal queries over variables. These expressions are cast in the language of probability. In the above, D is a directed graph whose edges represent causal influences; these influences are quantitavely specified by functions (structural equations) on variables. Finally, probabilities are assigned to variables not constrained by functions, these are exogenous variables. The causal effect of changing the variable x’ => x” on y is defined as the difference in expectation of the value that y will take. Note how the formalism includes explicit notation for interventions, do(x). A counterfactual conditional, is a conditional (or “if-then”) statement indicating what would be the case if its antecedent were true. Given that I make the assumption that all relevant factors remain equal (ie, gravity has not suddenly disappeared). Once we have expressions for counterfactuals, we can answer questions of type B), with the following results. Note that these results are expressed in terms of counterfactuals, which is why one needs theorem 7.1 as a prerequisite. This completes the brief listing of key results for the purposes of the discussion. Thankfully our example of a radioactive atom is very simple compared to the applications causal models were designed for; for our purposes we do not need to work hard to identify the structure nor the probabilities involved, these are given to us by the physics of nuclear decay. Q1) What is the causal effect of r=High on d? Q2) What is the probability of necessity P(N) of r = High, relative to the observed effect d = True? Q3) What is the probability of necessity P(S) of r = High, relative to the observed effect d = True? In order to interpret the answers to the above questions we must first go into some more details about causality and the models we have used. The light turning on was caused by me flipping the switch. General claims describe overall patterns in events, singular claims describe specific events. This distinction brings us to another consideration. The language in which causal models yield expressions is that of probability. We have seen probabilities assigned to the value of some effect, as well as probabilities assigned to the statement that a cause is sufficient, or is necessary. But how do these probabilities arise? Functional causal models are deterministic; the structural equations that describe causal mechanisms (graph arrows) yield unique values for variables as a function of their influences. On the other hand, the exogenous variables, those that are not specified within the model, but rather are inputs to it, have an associated uncertainty. Thus probabilities arise from our lack of knowledge about the exact values that these external conditions have. The epistemic uncertainty spreads from exogeneous variables throughout the rest of the model. [Pearl2000] handles the general/singular dichotomy elegantly: there is no crisp border, rather there is a continuous spectrum as models range from general to specific, corresponding to how much uncertainty exists in the associated variables. A general causal claim is one where exogenous variables have wide probability distributions; as information is added these probabilities are tightened and the claim becomes singular. In the limit, there is no uncertainty, the model is deterministic. We can go back to question 1) whose answer can be interpreted without much difficulty. Q1) What is the causal effect of r=High (high nuclear ratio) on d (decay)? So, relative to our model, high nuclear ratio is a cause of Beta- decay. Note that we can say this despite the fact that decay is intrinsically indeterministic. Even though the probabilities are of a fundamentally different nature, the empirical content is indistinguishable from any other general claim with epistemic uncertainty. Hence, in this particular case determinism is not required to speak of causation. The more controversial matter is attribution of cause for a singular indeterministic phenomenon, which is where we began. This is addressed by questions 2) and 3). Thus the truth of the statement that the decay of a radioactive atom has no cause depends on whether you are interested in sufficiency or necessity. In particular, that the atom would not have decayed were it not for its high nuclear ratio suggests this ratio was a cause of its decay. But let’s make things more complicated, let’s say there is a small probability that atoms with low nuclear ratios show Beta- decay. We’d have to say that (remember, relative to our model) the decay of a specific atom at some time has no cause, because neither criterion of sufficiency or necessity is met. The essence of causality, determinism? We can continue to stretch the concept. Imagine that a specific nuclear ratio for a specific atom implied a 99.99% probability of decay at some time t, and also that said probability of decay for any other nuclear ratio were 0.001%. Would we still be comfortable saying that the decay of such an atom had no cause? Singular indeterministic events are peculiar things. They behave according to probabilities, like those of general causation, but are fully specified, like instances of singular deterministic causation. Can we not just apply the methods and vocabulary of general causation to singular indeterministic events? In fact, we can. 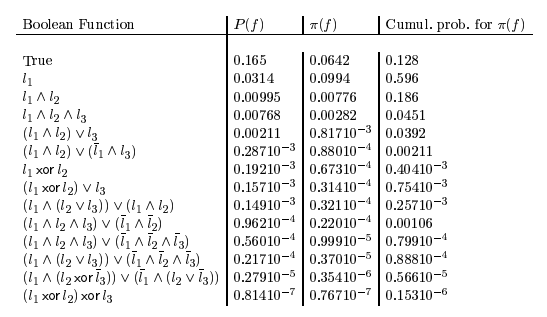 We can modify functional causal models such that the underlying structural equations are stochastic, as mentioned in [Pearl2000] section 7.2.2. Another method found in [Steel2005] is to add un-physical exogenous variables that account for the outcomes of indeterministic events. Both of these can be swapped into regular functional models. This should yield equivalent definitions of 9.2.1 and 9.2.2, where probability of sufficiency and necessity are replaced with degrees, giving corresponding versions of A2) and A3). In this approach, singular causation is not an all or nothing property, it is progressive. Just as general causal claims are expressed with epistemic probabilities, singular causal claims are expressed in terms of ontological probabilities. In this picture, saying that a particular radioactive decay had no cause would be wrong. Instead, perhaps we could say that a specific decay was “partially” or “mostly” caused by some property of that atom, rather than that there was no cause. I believe this conception of causality is more informative. Throwing out causation just because probabilities are not 100% is excessive and misleading, it ignores regularities and discards information that has predictive content. The essence of causation, I believe, is not determinism, but counterfactual prediction, which banks on regularity, not certainty. It seems reasonable to extend the language we use for general causes onto singular ones, as their implications have the same empirical form. Both make probabilistic predictions, both can be tested. What would it mean to say that some event has no cause, according to this interpretation? It would mean that an event is entirely unaffected by, and independent of, any of the universe’s state; no changes made anywhere would alter the probabilities we assign to its occurence. Such an event would be effectively “disconnected” or “transparent”. We could even imagine a completely causeless universe, where all events would be of this kind. It is not easy to see how such a strange place would look like. The most obvious possibility would be a chaotic universe, with no regularities. If we described such a universe as an n-dimensional (eg 3 + 1) collection of random variables, a causeless universe would exhibit zero interaction information, and zero intelligibility, as if every variable resulted of an independent coinflip. But it is not clear to me whether this scenario necessarily follows from a causeless universe assumption. The essential ingredient of causation, as argued in Pearl (2009:361) is responsiveness, namely, the capacity of some variables to respond to variations in other variables, regardless of how those variations came about. One can see how the probability of success (or any binary variable) in a bernoulli process is updated as more and more outcomes are observed.